Seattle Parks and Recreation are seeking your input on their Walk in the Park program, and on better ways to get people to enjoy parks without cars. They are asking for activity ideas, locations for events and activities, suggestions of parks that are suited to road closures, and other similar ideas. Do you have an idea or an opinion? Fill out the survey here, or go to the Walk in the Park page to find out more. Thanks to Mike Cheney for the heads-up! We noticed recently that the work on the east side of the 17th and Beacon intersection has reopened to traffic. The planters and pedestrian-scale lighting don’t appear to be there yet, though. With luck this will be a safer intersection for pedestrians crossing 17th at this spot. 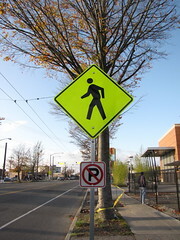 It doesn’t seem to affect those crossing Beacon to the library, however. 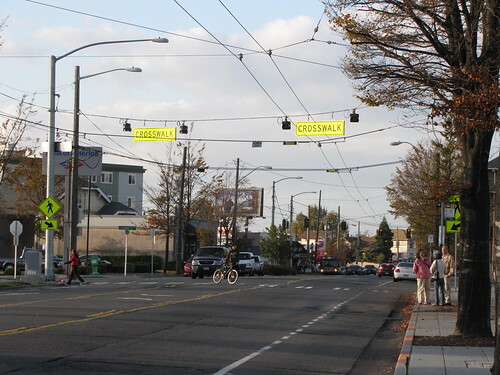 Does the “left turn only” sign mean that drivers can no longer cross Beacon and continue southward on 17th? 17th and Beacon intersection, across from the library. Photo by Jason. Metro bus in West Seattle -- thanks Seattle Municipal Archives! There has been quite a bit of discussion about bus service changes when light rail comes on board. It would be great to have a discussion about this and fill out our surveys as a neighborhood! I’ve contacted Metro and they are sending me about 50 surveys (in multiple languages) to hand out at the Pancake Breakfast THIS Saturday at El Centro – 9:30AM. A bus service and light rail discussion will go hand-in-hand at our forum on creating a town center, because you can not create a “town center” without adequate access by ALL modes. We have an amazing opportunity with the light rail to be more connected to southend neighborhoods and downtown, but bus service is still crucial for local trips. 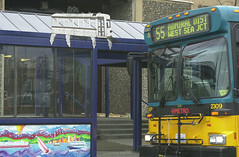 The current Metro plans include a potential crosstown route that will connect the Hill with West Seattle, possible changes to the 38 to eliminate redundant service once the light rail opens, and more.